Let’s Read-along Dickens and Tolstoy! Last December, a number of us faced down A Tale of Two Cities. It was a bit of a divisive book and I think that might be a common theme when it comes to Dickens. Personally, I hated the first part but then came around once I stopped having to trudge through descriptions of post carriages and fog. This year, we’re going for The Pickwick Papers. I think I *might* have voted for this one in the poll that Bex had up on her blog for a while but I can’t remember. So if it’s rubbish, I’m 80% certain that I pretty much only have myself to blame. Introductions will be up on 17 November and we’ll be reading about 12 chapters a week, finishing up on 22 December. That’s five weeks of Samuel Pickwick, the Pickwick Club his and fellow “Pickwickians”. Good times (hopefully). 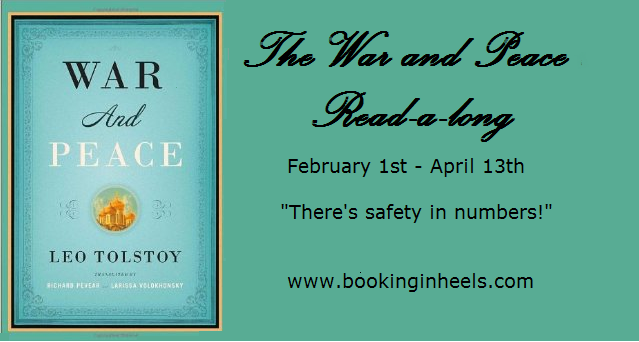 Next up will be Hanna’s read-along of War and Peace. Yup, the Russian epic, 1,000 page + tome War and Peace. Honestly, I am both horrified and excited by this one. I really want to have read War and Peace but I’m reluctant about actually having to read it. The chances of me actually reading this by myself are slim to none. In a sad quirk of fate, I was so scared of this that I didn’t even put it on my Classics Club list so I won’t even be reading this for that bonus moment of getting to cross it off a list. So this had better be good! We’ll be kicking off on 1 February and spreading the terror over ten weeks, finishing up on 13 April. There’ll be unpronounceable names, questions and rambling – what’s not to love?